Obwohl der British Raj erst nach dem Zeitraum beginnt, der in dieser Quellenkunde abgedeckt wird, wurden in der Zeit des Britsh Raj vielerlei Untersuchungen angestellt und Berichte veröffentlicht, die auch für die Zeit davor relevante Informationen enthalten. The Indian Census had two immediate precursors. On the one hand the regional gazetteers, censuses and regional surveys in India, and on the other the British decennial censuses beginning with the 1801 census. Both of these historical antecedents of the Indian Census have their foundation in the 'statistical movement', which gathered great momentum in Britain in the 18th and 19th centuries. While this movement, at least as it led to the accumulation of social statistics, had the administrative purpose of more efficiently matching state resources to social needs (note the strict etymology of 'statistics'), in the colonial context its manifestation in the early Indian Censuses can not be divorced from Britain's colonisation of India. The gathering of statistical data inevitably requires a procedure of classification. With the early Indian Censuses the process of classifying social institutions and structures led to the creation of an authoritative representation of Indian society. That the Indian Censuses were a product of the colonial encounter becomes even more notable in the proliferation of ethnographic essays in the early Indian Censuses, a feature that may appear strange to us now, prepared as we are by our experience of contemporary censuses for dry collections of numbers arranged in neat tables. The early Indian Censuses, therefore, present not merely as statistical accounts of early modern India, but also as documentation of the British encounter with its colonised other; as documentation of the coloniser's attempts to come to an understanding of its colonial subjects and integrate India – at least from an administrative perspective – within the British Empire." "A gazetteer is a geographical dictionary or directory, an important reference for information about places and place names (see: toponomy), used in conjunction with a map or a full atlas. It typically contains information concerning the geographical makeup of a country, region, or continent as well as the social statistics and physical features, such as mountains, waterways, or roads. Examples of information you would find include the location of places, dimensions of physical features, population, GDP, literacy rate, etc. This information is generally divided into overhead topics with entries listed in alphabetical order. Gazetteers of ancient Greece existed since the Hellenistic era. The first known gazetteer of China appeared by the 1st century, and with the age of print media in China by the 9th century, the Chinese gentry became invested in producing gazetteers for their local areas as a source of information as well as local pride. Although existent only in fragments, the geographer Stephanus of Byzantium wrote a geographical dictionary in the 6th century which influenced later European compilers of gazetteers by the 16th century. Modern gazetteers can be found in reference sections of most libraries as well as on the Web." Hunter, William Wilson <1840 - 1900>: The imperial gazetteer of India. -- London : Trübner, 1881. -- 9 Bde. ; 23 cm. PREFACE TO THE FIRST EDITION OF 1881. 'We are of opinion,' wrote the Court of Directors in Early 1807 to their servants in Bengal, 'that a Statistical Survey of the country would be attended with much utility ; we therefore recommend proper steps to be 1855 taken for the execution of the same.' The despatch from which these words are quoted forms one of a long series of instructions in which the East India Company urged a systematic inquiry into its territories. The first formulated effort in Bengal dates from 1769, four years after that Province came into its hands ; the latest orders of the Court of Directors on the subject were issued in 1855, three years before the administration of India passed from the Company to the Crown. During the interval many able and earnest men had laboured at the work, manuscript materials of great value had been amassed, and several important volumes had been published. But such attempts were isolated, directed by no central organization, and unsustained by any continuous plan of execution. 1 Executed by Mr. Charles Grant (now Sir Charles Grant, K.C.S.I. ), of the Bengal Civil Service, sometime Member of the Viceroy's Legislative Council and Foreign Secretary to the Government of India. —Orders of the Government of India, No. 1758, dated 19th October 1867. 1 Mr. Alfred Lyall, C.B., of the Bengal Civil Service, then Commissioner of West Berar; now Sir Alfred Lyall, K.C.B., and Lieutenant-Governor of the North-Western Provinces and Oudh. In carrying out these instructions, I found that the series of previous efforts had failed from two distinct causes. In one class of cases, a central officer of rank and ability had been appointed ; but he had not been supported by adequate machinery for collecting the local materials. In another class, the District Officers had been left to work each on his own plan, without the guidance of any single mind. The first class had failed from want of local organization ; the second, from want of central control.1 The task set before me consisted, in fact, of two separate stages—First, a ' local inquiry,' conducted [S. x] on a uniform scheme, throughout each of the [then] 240 Districts, or administrative units, of British India : Second, the consolidation of the materials thus obtained into one book. The first stage could be effected only by a Statistical Survey of India ; the second is represented by The Imperial Gazetteer. No basis existed at that time for either of these works. 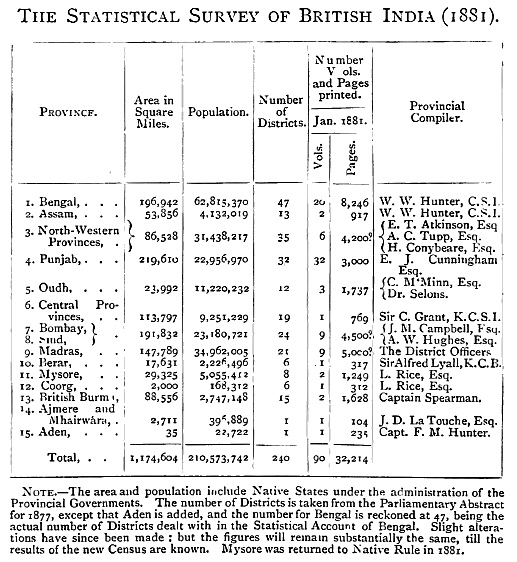 A Census had never been taken for British India ; and in some Provinces the different departments of the same Government grounded their financial and administrative demands on widely diverse estimates of the population. First , to eliminate the causes of previous failures, by providing a uniform scheme, a local mechanism, and a central control. Third, to secure the co-operation of the Provincial Governments,—lukewarm heretofore in such matters,—by respecting their individuality, and by modifying the uniform scheme to suit the circumstances of their several Provinces. Fourth, to collect the materials at once systematically and cheaply, by enlisting the unpaid agency of the District Officers throughout India under a central control. 1 Printed at the Home Secretariat Press, 144 pp. folio. Calcutta, 1870. 2 Proceedings of the Government of India, dated 8th September 1871. 'The operations,' wrote the Governor-General in Council, 'will extend over ten separate Governments which, with their Feudatory States, administer a territory of 1½ million square miles and govern a population [S. xi] estimated at 200 million souls [since found to be 255 millions]. The work represents, therefore, a series of local inquiries and comparative statistics, spread over an area but little less than that of all Europe, excepting Russia,' and a population then exceeding that of all Europe, less Russia. With a view to securing Median uniformity in the materials, I drew up six series of leading questions,1 illustrating the topographical, ethnical, agricultural, industrial, administrative, and medical aspects of an Indian District. These have served as a basis for the Statistical Survey throughout all India. With a view to securing punctuality of execution, Provincial Compilers were appointed, each responsible for getting in the returns from the District Officers within the territories assigned to him ; for supplementing those returns by information from heads of Departments and other local sources ; and for working up the results into the Statistical Account or Gazetteer of the Province. In this way, the unpaid co-operation of the administrative staff throughout the 240 Districts of India was enlisted, the best local knowledge was brought to bear, while in each Province a paid editor was answerable for the completion of the working on a uniform plan and within a reasonable time. The supervision of the whole rested with me, as Director-General of Statistics to the Government of India. During one-half of each year, I visited the various Provinces, especially Bengal, which I retained in my own hands as Provincial Editor in addition to my duties as Director-General. The other half of each year, I devoted to testing and working up the results. During the past twelve years, the Statistical Survey has been conducted throughout the whole of British India. The District forms the administrative unit in India, and the Statistical Survey furnishes an elaborate [S. xii] account of each of the 240 Districts. The Province is the administrative whole in India, and the Statistical Survey groups all the District materials into fifteen Provincial Accounts or Gazetteers. Such a work, if it is to furnish a basis for administrative action in India, and supply data to the Controlling Body in England, must be at once comprehensive and minute. The District and Provincial Accounts will form about 120 printed volumes, aggregating 50,000 pages, of which 90 volumes, making over 32,000 pages, were issued by 1880. The operations have (1881) been completed throughout 12 Provinces and 210 Districts, representing a population of about 190 millions of souls. The Feudatory States and Chiefdoms, exceeding 300 in number, with 50 millions of people, were from the first placed outside the scope of the Statistical Survey. In these territories it was unsuitable to attempt minute investigations, which the native princes would have been likely to misunderstand, and able to frustrate. 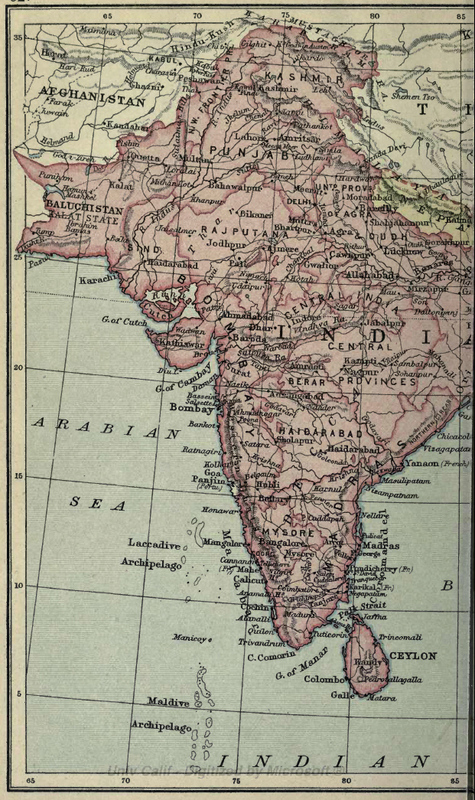 Accordingly, my Plan of 1869 restricted the Statistical Survey to the British territories, but pointed out that the Native States must be included in the ultimate compilation for all India, that is, the Imperial Gazetteer. Steps were therefore taken to bring together the information already existing regarding the Native States, and to supplement it. In States temporarily under British management, this was quite practicable ; and Major Powlett's account of Alwar supplies an admirable specimen of what may be done under these circumstances. Apart from such exceptional cases, I found that the 300 Native States of India had to be dealt with in five great groups. The first and most numerous class comprised the States and Chiefdoms which are in political dependence on the Provincial Governments. These States have accepted a large measure of British supervision, and the Provincial Compilers were able to draw up fairly adequate accounts of them. For the third group, including the Central India States, I did not find myself in a position to bring forward specific proposals ; and in the case of several of them, this book will add but little to the sum of human knowledge. In the fourth group, or the territories of the Nizam, efforts were made at an [S. xiv] early stage to obtain the necessary materials from His Highness' Government. 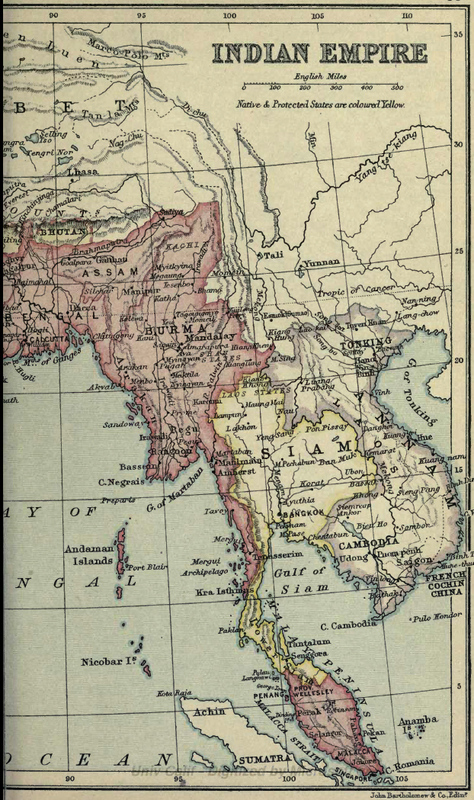 The fifth group consisted of Frontier and Independent States, such as Afghānistān, Burma, and Nepāl. Some account of such States would be expected in the Imperial Gazetteer of India. But any account of them, drawn up from official sources and issued under the authority of the British Government, might give rise to uneasiness among the Princes who rule those territories, our neighbours and allies. After full consideration, it was decided that no special inquiry should be made with regard to trans-frontier Independent Kingdoms, and that no official documents should be used. The articles upon them in the Imperial Gazetteer are, accordingly, a mere reproduction of accounts already before the public ; and for them no responsibility attaches to the Government. 1 The Rājputana Gazetteer, 1879-80. Of the five groups of Native States, therefore, the first was satisfactorily dealt with by means of the Provincial Compilers ; the fifth can scarcely be said to have been dealt with at all. In the three intermediate groups, many isolated efforts were made, and a special Assistant was deputed to me in the Foreign Office, Calcutta, with a view to putting together the materials already existing. His labours were afterwards supplemented in the Political Department of the India Office. But the confidential relationship between the Government of India and its Feudatory States, the dislike of the native Princes to inquiries of a social or economic character, and the scrupulous delicacy of the Foreign Office to avoid grounds of offence, have rendered a complete treatment of such territories impossible. I beg that those who use this book will believe that the occasional meagreness of the results, and the inadequate treatment of certain Native States, are due not to want of anxious effort on my part, but to the conditions under which I worked. In some cases I have had to fall back on the old materials compiled, at the expense of the Court of [S. xv]Directors, by Mr. Edward Thornton in the India House, and published by their authority, in four volumes, in 1854.1 As a whole, therefore, the articles on the Native States represent a much less exact method of inquiry than those on the British Provinces. They will be found, however, to mark a material advance in our information regarding Feudatory India. The basis for more systematic operations, a Census of the Feudatory Territories, dess not exist ; and a Statistical Survey of the Native States still remains unattempted. 1 Under the title of A Gazetteer of the Territories under the East India Company and of the Native States on the Continent of India. (4 volumes.) This work, excellent at its date, was compiled between the years 1844 and 1854; Mr. Thornton being paid a sum of money by the Court of Directors in addition to his salary, 'it being distinctly understood that the copyright is to vest in the East India Company' (Resolution of the Court of Directors, 18th February 1846). Previous Gazetteers had described, with industry and sometimes with eloquence, the famous cities of India, its historical sites, and great Provinces. But in the absence of systematic materials, they had to depend on the chance topography of tourists, or on a place happening to find its way into the records of the India House. A petty hamlet in which some traveller had halted for a night, or any locality which had formed the subject of a correspondence with the Court of Directors, stood out in bold relief; while great tracts and rivers, or the most important features of large Provinces, were passed over without a word. My first business, therefore, was to take care that every place which deserved mention should be enumerated ; my second, to see that it received neither less nor more space than its relative importance demanded. With a view to the first object, I sent circulars to the Provincial Editors and District Officers, calling for a return, upon clearly-stated principles, of every town, river, mountain, historic site, religious resort, commercial fair, harbour, or other place of importance in each District of British India. This list I checked from the Statistical Survey, and supplemented with many places which, although of no local significance, had obtained prominence in the literature of India. Eleven thousand names were thus arranged in alphabetical order. No such list had ever before been compiled for Her Majesty's Indian Empire. After being thinned out, it was printed in a folio volume, and forwarded to all the Local Governments in India, with a request that they would ascertain that the enumeration was correct as regards the territories under their care. I finally revised the list by the light of their suggestions, and selected about 8000 places for treatment in the Imperial Gazetteer. During the interval which elapsed before their replies could be received, I drew up model articles [S. xvii] showing paragraph by paragraph the method of treatment ; and I got together the missing materials for Provinces where the Statistical Survey had not sufficiently advanced to yield them. In this way, I placed in the hand of each contributor to The Imperial Gazetteer the names of the places of which he was to treat, together with the complete materials for dealing with them, and also an exact mould into which those materials were to be squeezed. The value of the work, as a guide to administration, is impaired by the fact that its figures cannot be brought up to date. The basis of Indian statistics is still the Census of 1872, taken a few months after my appointment as Director-General ; and the Government has decided that the publication of the Gazetteer must not be delayed, with a view to obtaining the results of the new Census of 1881. Even the Census of 1872 does not supply a uniform basis for the whole of India ; and in certain Provinces I have had to work on enumerations taken in 1867, 1868, 1869, and 1871. Much labour has been expended in bringing up the economic statistics to a more recent date, with the help of Administration Reports, and by special inquiries. But the length of time necessarily occupied by a Statistical Survey of a Continent, nearly equal to all Europe less Russia, rendered it inevitable that the results should refer to different years during its progress. My figures represent substantially the population statistics of India in 1872, with the administrative and trade statistics from 1875 to 1879. In some cases, even this degree of uniformity has not been found practicable ; in others, I have brought the facts down to 1880. But the reduction of the statistics of India to a uniform basis must be deferred for a second edition, after the results of the new Census are obtained. In its other aspect, as a book for general reference, the [S. xviii] Imperial Gazetteer is also less perfect than I could have wished in several points. The Governor-General in Council found that the task of collecting the administrative materials and statistics would prove a burden quite as heavy as he deemed expedient to lay upon the Local Governments. The historical aspects were expressly left to the voluntary research of the Provincial compilers. From the first, one of the Local Governments objected even to this moderate scope being allowed for matters not directly of an official character. The emphasis which the Governor-General in Council laid in 1875 on the responsibilities of the Provincial Governments for the tone and contents of the work, seemed to several of them to render general disquisitions unsuitable. Even in the Provinces of Bengal and Assam, which I retained in my own hands as Provincial Editor, every sheet had to receive the sanction of the Local Government before it was printed off. Many topics of social or political interest were excluded ; and a general introductory volume, after being in part printed, was not issued. But if the history of India is ever to be anything more than a record of conquest and crime, it must be sought for among the people themselves. Valuable historical materials had been collected for the Statistica Survey; and in 1877, the Secretary of State for India decided that a wider scope should be allowed me for their use in the Imperial Gazetteer. I have done my best to give effect to that view ; and it will be seen, for the first time in these volumes, that every Indian District has its own history. The true territorial unit of Indian history is, indeed, much smaller than the British District. For example, he who would study the history of Oudh must search for it in the parganā or parish; in other parts of India, the zamindāri or estate is the historical unit ; in others, the chiefship ; while in a few, the rural districts were mere appendages to the great cities. Had it been [S. xix] permitted me to subject the rural annals of India to systematic inquiry, as I wished, a rich harvest would have been gathered in. The historical accumulations made by the wayside, in conducting the Statistical Survey, have proved of much value. But in attempting to incorporate them into the Imperial Gazetteer, I have had frequently to choose between using materials which, owing to the earlier instructions, I had been unable to test ; or rejecting statements, in themselves new and interesting, but which, in the later stages of the work, I could not personally verify. 1 The longitudes require a constant correction of minus 2½ minutes (—0° 2' 30") to reduce them from the adopted value of 80° 17' 21' for the longitude of the Madras Observatory, on which they have been based, to the value of 80° 14' 51", which was determined electro-telegraphically in 1876-77. It is not improbable that some further minute correction may be hereafter made ; and the Surveyor-General has deemed it undesirable that the values of all the individual longitudes should be altered, until the final determination has been arrived at. the local authorities; and although I may see that there is something wrong, I am unable to set it right. I beg that those who may come after me will, in improving on my work, remember the conditions under which it has been done. When it was begun, no one knew exactly the population of a single Province of India, or of a single District of Bengal. In the latter Province alone, the Census of 1872 suddenly disclosed the presence of 22 millions of British subjects whose existence had never previously been suspected. The population of Bengal and Assam, up to that time reckoned at 40 millions, was ascertained in 1872 to number 67¾ millions of souls. The spelling of names of Indian places has long formed a subject of controversy. Without a uniform system of rendering them, an alphabetical Gazetteer could not start ; and one of my first duties was to lay down a system for transliterating Indian Proper Names. In existing Gazetteers of India, the same word appears under many forms. The best work of this class gives eleven different spellings of the same town, not one of which is exactly correct ; and in order to be sure of finding a place, the inquirer has to look it up under every possible disguise. The truth is, it requires a careful study of the vernacular languages of India, and some knowledge of Sanskrit, which forms the key to them, before one is able to spell local names correctly in the native alphabets. It next requires a well-considered system of transliteration in order to render such names into the English character. For it must be remembered that the Sanskrit alphabet has fifty letters or signs, while the English alphabet has only twenty-six. Thus, the Roman alphabet has but one letter for the consonant n ; the Sanskrit has four letters for it, in its various modifications, as a dental, lingual, palatal, and guttural. On the other hand, the Indian alphabets attach a uniform sound to each vowel ; while in English, the same [S. xxi] vowel may have several sounds, such as u in but, put, cure, rural. Indian names can therefore be represented only in a loose and popular manner in our alphabet ; unless, indeed, we manufacture a new Roman alphabet with additional letters, by means of accents over the vowels, dots under the consonants, italics, or similar devices of typography. A recognition of this fundamental difficulty should make an Indian spelling-reformer moderate in his aims and patient of opposition. I first collected about 15,000 names of places, written out by competent natives in the vernacular character; and transliterated them accurately on the method adopted by the Royal Asiatic Society. But the multitude of accented vowels and dotted consonants convinced me that such precision was impracticable for popular use. I therefore re-transliterated them on a more simple system, discarding dotted consonants altogether, using as few accents as possible over the vowels, and abstaining from liberties with the alphabet which would give it an un-English look, and perplex the ordinary reader. My object was, not to write a paper for the Asiatic Society's Journal, but to lay down a uniform system which might afford a practical settlement of the long dispute about Indian orthography, by being adopted by all fairly educated men. The task was complicated by the circumstance that three systems had co-existed during nearly a century. For two of the rivals a good case might be made out. Popular usage had drawn at random from all three, and a number of important places had thus obtained an historical or literary fixity of spelling. Well-known names of this last class, when transliterated in an unwonted fashion, or by a rival method, had a strange look, which afforded scope for pleasantries. Yet one system had to be accepted and resolutely adhered to. The method which I have adopted does not attempt to represent the fine distinctions of the Sanskrit consonants, [S. xxii] such as the dental and lingual d. But it attaches a uniform value to each vowel, namely, a and u as in rural; e as in grey, méchant ; and i and o as in police. The accented á, í, and ú represent the long forms of the same vowels in Sanskrit, or the sounds in the English words far, pier, and lure. Some Indian names, however, have grown so familiar historical as to render a rectification of their spelling impracticable. Such names have been considerately dealt with. I found that they arranged themselves under two classes. In the first class, the popular or historical fixity of spelling had so hardened and set as to preclude any alteration whatever; thus, Calcutta, Madras, and Bombay. In the second class, it was possible to bring the spelling somewhat nearer to the uniform system, without destroying the historical or popular identity of the word. For example, the multiform terminal pur, pore, poor, poore, a city, might be uniformly given in its correct Hindi form as pur, even if the body of the word could not be rectified; while the similar termination nagar, nagore, nugger, nuggur, naggore, etc., a town, might be uniformly rendered nagar. Such a system, like all compromises, was open to the strictures of both the extreme parties—of the scrupulous purists on the one hand, and of the obstinate upholders of the old confused spelling on the other. It commended itself to the intermediate body of reasonable men. The Government of India, in 1870, accordingly promulgated my system of transliteration in the Official Gazette, and formally authorized its adoption. It remained to organize machinery for enforcing its general use. Several of the leading Indian journals expressed their willingness to adopt a uniform system of spelling which presented no typographical difficulties. Up to that time, the same place used to appear under diverse forms in the different newspapers, and was [S. xxiii] often variously rendered in different columns of the same journal. A printed volume containing the correct spelling of all Indian places was circulated to the Press, to literary institutions, libraries, publishing houses, and to the official Departments. But the chief sources from which Indian news is derived, and from which Indian orthography emanates, are the Government Gazettes and Administration Reports. The official Gazettes in India give much of the information which in England would be communicated by Her Majesty's Ministers to Parliament. Each Provincial Government has its own set of Reports and its own Gazette—the latter sometimes swelling into a weekly folio of over a hundred pages, filled with State papers. The Governor-General requested each of the Provincial Governments to draw up a list of places within its own territories, spelt on my system. These lists, after receiving his sanction, were to be published in the Gazettes, and to be thenceforth adopted in them and all other official publications. The Provincial Governments carried out the principles of transliteration with varying degrees of uniformity, and took widely different views as to the number of names which had obtained a popular fixity of spelling. This was inevitable ; and the Governor-General in Council, in revising the lists, endeavoured to remove divergences and to attain the maximum degree of uniformity. Owing to the number of languages and alphabets used in India, the work extended over nearly ten years. The Provincial Governments have been induced to reconsider their first efforts ; and in each new edition, they have approached more closely to the lines originally laid down. In one Presidency, indeed, the latest revision has advanced beyond the limits of accuracy which I had thought practicable. Throughout India, every year sees the uniform system of spelling more generally introduced ; it has been accepted in the [S. xxiv] Parliamentary blue-books at home, and is irresistibly forcing its way into the English press. Meanwhile, the Imperial Gazetteer had to march on. The Government decided that the publication of the Gazetteer should not, in any circumstances, be delayed beyond the year 1881. The proof sheets had to pass under the revision of the Secretary of State in Council ; and most of them were, accordingly, printed in 1879 and 1880. I therefore did my best to arrive at the true spelling of each name, starting from my own lists in the vernacular character, and usually accepting the Provincial lists as drawn up by the Local Governments, when they arrived in time ; although not delaying the work by waiting for their final revision. It sometimes happened that adjoining Governments adopted different renderings for the same word, such as a river or a border district ; while each Government introduced variations in revised editions of its own list. If an attempt were made to introduce a uniform system of spelling proper names for all Europe, similar delays and difficulties would arise. It must be remembered, too, that India has no common alphabet, like the alphabet Roman alphabet in Europe, but a variety of local characters, which render the same word by different letters. Thus, apart from the difficulty of dental and lingual forms ; the commonest of all terminals, pur, a town, is spelt with a short u in Hindi and by most of the Sanskrit family of alphabets, and with a long ú in the Urdu alphabet, derived from Arabic sources. Dialectal variations also play a confusing part ; a universal place-name like Sivapur or Shivapur, being hardened into Sibpur in Bengal, and softened into Hiwapur in the adjoining Province of Assam. It will therefore be possible to discover instances in which the rendering of a name in the Imperial Gazetteer differs from that ultimately sanctioned by the Government of India. [S. xxv] But candid inquirers will, I hope, find the degree of uniformity which has been arrived at by the Provincial Governments and myself, more surprising than the occasional variations. I must not let this work pass from my hands without expressing my sincere thanks for the help which I have so liberally received in its preparation. It has been officially described as the only example of a national undertaking of the sort, being carried out under the uninterrupted direction of one mind, from the initial District Survey to the final alphabetical compilation in a Gazetteer. But such merits as it may be found to possess, are due in large measure to the zealous and friendly help of my fellow-workers. I feel especially grateful to the District Officers throughout India who have supplied the local materials. On their unselfish labours the fabric of this work, as, indeed, of the whole Indian administration, rests. The Provincial Compilers of the Statistical Survey, enumerated on page xii., have also my sincere thanks. In particular, the volumes of Mr. Atkinson on the North-Western Provinces; of Mr. Campbell on the Bombay Presidency ; and of Mr. Rice on Mysore, form models of administrative research. Mr. Hughes' work on Sind also deserves high praise. The condensation of the Statistical Survey of the Provinces into The Imperial Gazetteer has been conducted chiefly in England, where the cost of literary work is much less than in India. In that task I have had, at intervals, the aid of Mr. H. P. Piatt, Fellow of Lincoln College ; Major-General J. Clarke, formerly Commissioner in Oudh ; Mr. J. S. Cotton, late Fellow and Lecturer at Queen's College, Oxford ; Mr. Grant Allen, late of Merton College, Oxford ; Miss Alice Betham (now Mrs. Mackenzie), sometime Acting Tutor of Girton College, Cambridge ; Miss Margaret Robertson ; Mr. G. Barclay, M.A. ; the Rev. E. Cunningham, M.A. ; Mr. [S. xxvi] Philip Robinson, late Professor of History in the Government College, Allahābād. I shall ever look back with pleasure to my connection with this able and friendly body of fellow-workers. To Mr. Cotton, and to Mr. Charles Dollman who has been my assistant throughout, I owe in a special manner my thanks. Apart from the literary compilation, I have endeavoured to bring the best practical knowledge to bear upon the revision of the work. My obligations in this respect to distinguished Indian Administrators are too numerous to be specifically detailed. But I desire particularly to thank Sir William Muir, formerly Lieutenant-Governor of the North-Western Provinces, for his kind revision of the article on those territories ; Sir William Robinson, sometime Acting Governor of Madras, for his contributions to articles on that Presidency, and for his untiring friendly help ; Sir Robert Montgomery and Sir Henry Davies, sometime Lieutenant-Governors of the Punjab ; Mr. Lewin Bowring, C.B., sometime Chief Commissioner of Mysore ; and General Fytche, C.S.I., sometime Chief Commissioner of British Burma, for their personal contributions to, or revisions of, the articles on the Provinces which they formerly ruled. Mr. J. H. Batten, sometime Commissioner of Kumāun and Garhwāl, supplied in chief part the articles on these Districts. Many other retired administrators have, in like manner, enriched my materials with monographs on the territories in which their life's work was done. In each of the principal articles, I have tried to get the sheets revised by the person with the largest administrative experience of the Presidency or Province. To Colonel Yule, C.B., the editor of Marco Polo, I am indebted for scholarly and most generous aid in all articles which deal with the mediaeval history of India. A separate Archaeological Survey is now at work in India ; but only a very small portion of its results reached me in time to be incorporated into the Imperial [S. xxvii] Gazetteer. The existence of that Survey precluded me from independent researches within its jurisdiction. I hope, therefore, that the next edition of this work will deal more fully and accurately with Indian antiquities than it has been in my power to do. But the reader will find how deeply my pages are indebted to the Reports already issued by General Cunningham, the head of the Archaeological Survey ; and to Dr. Burgess, the Archaeological Surveyor for Western India. Mr. W. Rees Philipps has assisted me in the revision of the Madras articles, and supplied interesting materials regarding the Christian population. Mr. Buchan, the secretary to the Royal Scottish Meteorological Society, kindly revised the section of article INDIA which deals with his branch of science. My obligations to other friends, too numerous to enumerate here, are mentioned in the body of the work. Finally, I beg to tender my thanks to their Excellencies the Viceroy of Portuguese India, and the Governor-General of French India, for their courtesy to me while visiting their territories ; and for materials placed at my disposal by the chiefs of their respective administrations. The result was that, as already stated, every page of the twenty volumes of the Account of Bengal had to be passed by the Government of that Province, and every sheet of The Imperial Gazetteer has been submitted to the Secretary of State. But during the progress of the work, the personnel of the Local Governments has changed over and over again. More than thirty Governors or heads of administrations have ruled the Indian Provinces, while four successive Viceroys and four Secretaries of State have directed the Indian Empire. Some of these great functionaries have held decided opinions of their own on many important questions which arose in the conduct of the operations. The work, therefore, is the result of several not perfectly parallel forces. On the one hand, there was myself with a staff of fellow-workers, anxious to adhere to the Plan as originally laid down : on the other hand, there were a number of shifting Governments, local and central, some of them divergent in their views, and any one of them able to render my position difficult, and even, for a time, to impede the work. The delicacy of the situation was enhanced by the circumstance, that many points had to be decided in my absence from the head-quarters of the Government of India. From the first, during half of each year I was visiting the Local Governments, or on circuit through the Provinces ; latterly, I have been in England for considerable periods, while compiling the Imperial Gazetteer. I have to thank the Indian Governments, not only for the patience with which they have always listened to my views, but for the courteous reconsideration of decisions which they had arrived at in my absence. I undertook to see the work to an end, and I was placed in the best position for doing so. I have been enabled to examine the various Provinces of India with my own eyes, to study their local circumstances, and to travel [S. xxix] over fifty thousand miles by every means of civilised and uncivilised transport. If I have brought to a successful issue an enterprise in which abler men had failed, it is due to the support which I have thus received. The Governor-General in Council, or the Secretary of State, might at any time have simply ordered me to adopt the methods or measures which seemed to him best. Yet not only has there never been a single occasion during the twelve years in which commands have thus been substituted for argument ; but orders, passed after full deliberation, have been modified or rescinded to suit what I believed to be the requirements of the work. No revision by the Indian Government could take the primary responsibility off myself. This has been generously recognised throughout ; and the double supervision has never been permitted to give rise to a strain in the conduct of the undertaking. Whatever blemishes or deficiencies may be found in these volumes are due, therefore, not to the difficult double system of responsibility imposed by the Government, but to my own self, or to the fundamental conditions under which statistical inquiries have to be conducted in India. 1 Description de L'Egypte, ou recueil des observations et des recherches qui ont été faites en Egypte pendant l'expédition de l'armée Française. (36 volumes, 1821.) Twenty-one years were given to this magnificent work, four of them being devoted to local inquiries at the time of the military occupation, and seventeen being spent in working up the results. 'La Françe,' says the preface, after setting forth the brilliant and numerous staff of savants who took part in the survey, 'avait réuni tous ses efforts pour la conquête de cette contrée ; tous les efforts des arts ont été employés pour sa description.' The area dealt with was only a fraction of that now covered by the Statistical Survey of India ; the cost of the operations was many times as great. The results were sumptuously published under an Ordonnance du Roi, dated 1820, and dedicated to His Majesty Louis xviii., in 25 volumes of letterpress and 11 double folios of maps and illustrations. administrative detail ; the latter a brilliant effort of organized research. It was my hope, and the wish of the Viceroy—now, alas ! gone from this world—who most deeply impressed his personality on the undertaking, to make a memorial of England's work in India, more lasting, because truer and more complete, than these monuments of Mughal Empire and of French ambition. The scientific aspects of the country, its fauna, flora, and geology, already form the subject of elaborate volumes. For the most jmportant of them, such as the fishes, botany, geology, meteorology, and medical aspects of India, special Surveys or Departments exist. It would have been improper for me to intrude upon the ground so ably occupied. I have therefore confined myself on these heads to brief but careful sketches, such as might be useful to practical administrators, and referred the scientific inquirer to the separate standard works, or to the publications of the professional Indian Surveys. I have ever borne in mind that the work has been paid for by the Indian people, and that it was primarily designed as an aid to the better government of their country. Since the authority passed from the Company to the Crown, fundamental changes have taken place alike in the central control and in the local administration. As already mentioned, the transfer of the controlling power from the Court of Directors, a small body with special knowledge of the country, to Parliament, an assembly whose members have had for the most part no opportunity of studying Indian affairs, caused the necessity for a standard account of India [S. xxxi] to be more keenly felt. No book exists, sufficiently accurate and sufficiently comprehensive, to be generally accepted as a work of reference. Contradictory assertions can therefore be safely hazarded on almost every point of Indian statistics ; and Indian discussions commonly lose themselves in a wilderness of irrelevant issues. But if a standard account of India is required for the Controlling Body in England, the altered conditions of Indian service have rendered such a work still more necessary for the local administrators. The Company's servants accepted India as their home, and generally remained a long time in one District. But under the beneficent policy of the Queen's Proclamation, the natives of India every year engross a larger share of the actual government. The English administrators are accepting their ultimate position as a small and highly-mobilised superintending staff. hey are shifted more rapidly from District to District ; and the new system of furlough, with a view to keeping them at the utmost efficiency, encourages them to take their holidays at short intervals of four years, instead of granting long periods of idleness once or twice in a quarter of a century's service. They have not the same opportunities for slowly accumulating personal knowledge of one locality ; on the other hand, their energies are not allowed to be eaten away by rust. An officer, who had spent a dozen years in one District, might have little to learn from a printed account of it ; but to the present generation of quickly changed 'officiating' functionaries, such a work is indispensable. The thanks, gazetted and private, of the Provincial Governments prove that the Statistical Survey has fulfilled this its primary design in India. I hope that The Imperial Gazetteer will be found to answer the same purpose for the Controlling Body in Parliament, and the [S. xxxii] English public. It furnishes, for the first time, an account of India based upon a personal survey of the country, and upon an actual enumeration of the people. I trust that it may transfer many Indian questions from the region of haphazard statement to the jurisdiction of calm knowledge. 'Nothing,' I wrote in my original Plan, submitted to the Viceroy in 1869, 'nothing is more costly to a Government than ignorance.' I believe that, in spite of all its defects, this work will prove a memorable episode in the long battle against ignorance ; a breakwater against the tide of prejudice and false opinions flowing down upon us from the past ; and a foundation for a truer and wider knowledge of India in time to come. Its aim has been, not literary graces, nor scientific discovery, nor antiquarian research ; but an earnest endeavour to render India better governed, because better understood. For the first time in the history of our rule, an opportunity has fallen to me of finding out the truth about the Indian people, and of honestly telling it. Whether I have used that opportunity in a worthy spirit, and whether I have succeeded in the task in which so many previous attempts have failed, it is for others to judge. Sound knowledge is of slow growth, and no intensity of effort can do in twelve years for India what centuries of local research have accomplished for Europe. But when I compare the basis for future effort created by these volumes, with the absence of any systematic materials when I commenced the work, I feel that the first and most difficult stage has been passed. If the statistical survey of the Mughal India, conducted by Akbar's Finance Minister, had afforded such a basis, it would have proved invaluable to English administrators. What would European scholars not give for a similar account of the Roman Empire ! The territories dealt with in these volumes far exceed the Provinces which paid tribute to the Great Akbar, and contain a population exactly double Gibbon's estimate of [S. xxxiii] all the nations and races that obeyed Imperial Rome. I leave the work to the charitable judgment of those who can contrast it with the efforts of Indian statists who have gone before me ; I also leave it with a sure confidence that it will be improved by brethren of my Service who come after me. "HUNTER, SIR WILLIAM WILSON (1840-1900), British publicist, son of Andrew Galloway Hunter, a Glasgow manufacturer, was born at Glasgow on the 15th of July 1840. He was educated at Glasgow University (B.A. 1860), Paris and Bonn, acquiring a knowledge of Sanscrit, and passing first in the final examination for the Indian Civil Service in 1862. Posted in the remote district of Birbhum in the lower provinces of Bengal, he began collecting local traditions and records, which formed the materials for his novel and suggestive publication, entitled The Annals of Rural Bengal, a book which did much to stimulate public interest in the details of Indian administration. He also compiled A Comparative Dictionary of the Non-Aryan Languages of India, a glossary of dialects based mainly upon the collections of Brian Houghton Hodgson, which testifies to the industry of the writer but contains much immature philological speculation. In 1872 he brought out two attractive volumes on the province of Orissa and its far-famed temple of Jagannath. In 1869 Lord Mayo asked Hunter to submit a scheme for a comprehensive statistical survey of the Indian empire. The work involved the compilation of a number of local gazetteers, in various stages of progress, and their consolidation in a condensed form upon a single and uniform plan. The conception was worthy of the gigantic projects formed by Arthur Young and Sir John Sinclair at the close of the 18th century, and the fact that it was successfully carried through between 1869 and 1881 was owing mainly to the energy and determination of Hunter. The early period of his undertaking was devoted to a series of tours which took him into every corner of India. He himself undertook the supervision of the statistical accounts of Bengal (20 vols., 1875-1877) and of Assam (2 vols., 1879). The various statistical accounts, when completed, comprised no fewer than 128 volumes. The immense task of condensing this mass of material proceeded concurrently with their compilation, an administrative feat which enabled The Imperial Gazetteer of India to appear in 9 volumes in 1881 (2nd ed., 14 vols., 1885-1887; 3rd ed., 26 vols., including atlas, 1908). Hunter adopted a transliteration of vernacular place-names, by which means the correct pronunciation is ordinarily indicated; but hardly sufficient allowance was made for old spellings consecrated by history and long usage. Hunter's own article on India was published in 1880 as A Brief History of the Indian Peoples, and [S. 946] has been widely translated and utilized in Indian schools. A revised form was issued in 1895, under the title of The Indian Empire: its People, History and Products. In 1882 Hunter, as a member of the governor-general's council, presided over the commission on Indian Education; in 1886 he was elected vice-chancellor of the university of Calcutta. In 1887 he retired from the service, was created K.C.S.I., and settled at Oaken Holt, near Oxford. He arranged with the Clarendon Press to publish a series of Rulers of India, to which he himself contributed volumes on Dalhousie (1890) and Mayo (1892). He had previously, in 1875, written an official Life of Lord Mayo, in two volumes. He also wrote a weekly article on Indian affairs for The Times. But the great task to which he applied himself on his settlement in England was a history upon a large scale of the British Dominion in India, two volumes of which only had appeared when he died, carrying the reader barely down to 1700. He was much hindered by the confused state of his materials, a portion of which he arranged and published in 1894 as Bengal Manuscript Records, in three volumes. A delightful story, The Old Missionary (1895), and The Thackerays in India (1897), a gossipy volume which appeals to all readers of The Newcomes, may be regarded as the relaxations of an Anglo-Indian amid the stress of severer studies. In the winter of 1898-1899, in consequence of the fatigue incurred in a journey to the Caspian and back, on a visit to the sick-bed of one of his two sons, Hunter was stricken down by a severe attack of influenza, which affected his heart. He died at Oaken Holt on the 6th of February 1900." Hunter, William Wilson <1840 - 1900>: The imperial gazetteer of India. -- 2nd ed. -- London : Trübner, 1885-87. -- 14 Bde. ; 23 cm. The Imperial gazetteer of India / published under the authority of His Majesty’s Secretary of State for India in Council. -- New ed. -- Oxford : Clarendon Press, 1907-1909. -- 25 Bde. ; 22 cm. v. 5. Abāzai to Arcot. v. 6. Argaon to Bardwān. v. 7. Bareilly to Berasiā. v. 8. Berhampore to Bombay. v. 9. Bomjur to Central India. v. 10. Central Provinces to Coompta. v. 11. Coondapoor to Edwardesābād. v. 12. Einme to Gwalior. v. 13. Gyāraspur to Jais. v. 14. Jaisalmer to Karā. v. 15. Karāchi to Kotāyam. v. 16. Kotchāndpur to Mahāvinyaka. v. 17. Mahbūbābād to Morādābād. v. 18. Moram to Nayāgarh. v. 19. Nāyakanhatti to Parbhani. v. 20. Pārdi to Pusad. v. 21. Pushkar to Salween. v. 22. Samadhiāla to Singhāna. v. 23. Singhbhūm to Trashichod-zong. v. 24. Travancore to Zīra. The first edition of The Imperial Gazetteer of India was published in nine volumes in 1881. A second edition, augmented to fourteen volumes, was issued in the years 1885-7. A revised form of the article on India, greatly enlarged and with statistics brought up to date, appeared as an independent volume in 1893, under the title of 'The Indian Empire: Its Peoples, History, and Products.' All of these were edited by the late Sir William Wilson Hunter, K.C.S.I., who formed the original plan of the work as far back as 1869, when he was first entrusted with the duty of organizing a statistical survey of the country, and who wrote most of 'The Indian Empire,' in its final form with his own hand. His untimely death in 1900 has deprived the present edition of the advantages of his ripe experience and literary skill. The second edition having for some time passed out of print, it was resolved by the Government of India that a new edition should be prepared in connexion with the Census of 1901. The changes, however, that have been introduced, both in the general scheme and in the methods of compilation, may justify its being considered as a new work rather than a new edition. The bulk will be raised from fourteen to twenty-six volumes, including a companion Atlas ; and the single volume of 'The Indian Empire' has been expanded into four volumes, entitled respectively 'Descriptive,' Historical,' 'Economic,' and 'Administrative.' Moreover, while the main work will be arranged as before in alphabetical order, it is intended to issue in India, for official and local use, a parallel series, in which the several articles relating to each Province or large group of States will be collected together in [S. vi] separate volumes. No less considerable are the changes that have been made in methods of compilation. Apart from the historical volume and a few other chapters of 'The Indian Empire,' the whole of the work has been written by officials in India under orders of the Indian Government ; and every page has been submitted to the criticism of the several Administrations or Departments concerned. The task of editorial supervision has been shared between India and England. In India the first outlines were drawn up in consultation with Sir Herbert Risley, K.C.I.E., at the time when he was Census Commissioner. On his nomination to be Secretary in the Home Department, Mr. W. S. Meyer, C.I.E., was appointed editor for India ; and to him are due the detailed regulations under which the greater part of the work has been executed, the general scheme of the Atlas, and the primary revision of most of the chapters dealing with India as a whole. 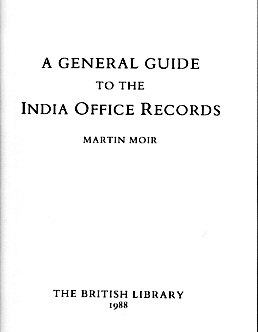 When he, in turn, was promoted to be Secretary in the Finance Department, he was succeeded by Mr. R. Burn, who has carried out the primary revision of most of the other volumes, and otherwise completed the work that had to be done in India.1 The editor in England throughout has been Mr. J. S. Cotton, who was closely associated with Sir W. W. Hunter in both the former editions. On him, in subordination to a committee appointed by the Secretary of State, has rested the responsibility for the final form of the work, and the duty of seeing the whole through the press. 1 The Indian editors desire to acknowledge specially the services of Mr. V. Krishna Menon, their head clerk. The volumes of 'The Indian Empire' have been entirely rewritten, with the exception of the history of the British period, where the personal impress of Sir W. W. Hunter's knowledge and style is preserved. The principle adopted was to entrust each subject to an author best qualified to deal with it either by special study or official experience. The names of the authors are usually appended to their chapters ; but in other cases the text, as finally approved, can be [S. vii] regarded only as a composite production based largely upon their contributions, and their names are then recorded elsewhere. This course has been found necessary in order to maintain the character of official authority that attaches to the work. The articles that make up the body of the Gazetteer have likewise been rewritten, for the most part by officials who had already acquired local experience as Census Superintendents of their Provinces or States in 1901. A list of their names will be found prefixed to the first volume of the Gazetteer proper. As in the previous editions, the articles are based on materials collected by District officers and officials of Native States, supplemented by special contributions from experts. More detailed acknowledgements will be found in the prefaces to the volumes of the Provincial Gazetteers. It may here be mentioned that, since the last edition was compiled, Upper Burma and Baluchistan have both been included within the Empire, and two new Provinces have been constituted, while much more accurate information is now available for the Native States generally. To come to details. Comparative statistics are usually given for the three Census years, 1881, 1891, and 1901 ; but in most cases later figures for 1903-4 have been added. The most recent administrative changes have been incorporated or referred to in footnotes, so far as possible. No novelties have been introduced in the way of spelling, the usage now generally Adopted in India having been followed, even where this usage cannot be considered satisfactory or consistent. The only important change is the substitution of the mark of length ( ¯ ) for the accent (') over long vowels. Some hints for guidance in pronunciation are given in an Introductory Note, prefixed to each volume. Another Introductory Note supplies a brief explanation bf the monetary system and the weights and measures used in India, for it has not been found practicable to convert these uniformly into their English equivalents. In the present volume, being the Descriptive volume of 'The Indian Empire,' chapters i, ii, iv, v, vii, viii, ix, and x [S. viii] have been written by the authors whose names are subscribed to them. Dr. Blanford died before he was able to revise his proofs. Of the other chapters, that on Meteorology is based upon materials contributed by Sir John Eliot, K.C.I.E., and that on Ethnology and Caste has been abridged from Sir H. Risley's chapter in the Report on the Census of India for 1901. The Index has been compiled by Mr. J. W. Browne." a collection of phonograph records of tribal songs and music. The scheme for a systematic and detailed ethnographic survey of the whole of India received the formal sanction of the Government of India in 1901. A Superintendent of Ethnography was appointed for each [S. x] Presidency or Province, to carry out the work of the survey in addition to his other duties. The other duty, in my particular case the direction of a large local museum happily made an excellent blend with the survey operations, as the work of collection for the ethnological section went on simultaneously with that of investigation. The survey was financed for a period of five (afterwards extended to eight) years, and an annual allotment of Rs. 5,000 provided for each Presidency and Province. This included Rs. 2,000 for approved notes on monographs, and replies to the stereotyped series of questions. The replies to these questions were not, I am bound to admit, always entirely satisfactory, as they broke down both in accuracy and detail. I may, as an illustration, cite the following description of making fire by friction. "They know how to make fire, i.e., by friction of wood as well as stone, etc. They take a triangular cut of stone, and one flat oblong size flat. They hit one another with the maintenance of cocoanut fibre or copper, then fire sets immediately, and also by rubbing the two barks frequently with each other they make fire." For information relating to the tribes and castes of Cochin and Travancore, I gratefully acknowledge my indebtedness to Messrs. L. K. Anantha Krishna Aiyer and N. Subramani Aiyer, the Superintendents of Ethnography for their respective States. The notes relating to the Cochin State have been independently published at the Ernakulam Press, Cochin. In the scheme for the Ethnographic Survey, it was laid down that the Superintendents should supplement the information obtained from representative men and by their own enquiries by "researches into the considerable mass of information which lies buried in official reports, in the journals of learned Societies, and in various books." Of this injunction full advantage has been taken, as will be evident from the abundant crop of references in foot-notes. It is impossible to express my thanks individually to the very large number of correspondents, European and Indian, who have generously assisted me in my work. I may, however, refer to the immense aid which I have received from the District Manuals edited by Mr. (now Sir) H. A. Stuart, I.C.S., and the District Gazetteers, which have been quite recently issued unde the editorship of Mr. W. Francis, I.C.S., Mr. F. R. Hemingway, I.C.S., and Mr. F. B. Evans, I.C.S. For some of the photographs of Badagas, Kurumbas, and Todas, I am indebted to Mr. A. T. W. Penn of Ootacamund. I may add that the anthropometric data are all the result of measurements taken by myself, in order to eliminate the varying error resulting from the employment of a plurality of observers. Bd. 1. book I. General. book II. Bengal. Bd. 2. book III. The system of village or Mahāl settlements. Bd. 3. book IV. The raiyatwāri and allied systems. Beispiel daraus: The relation of landlord and tenent in Bengal. The student who approaches the subject of Indian Land-tenures, and of the systems under which the State levies a revenue from the land, has probably a vague idea that he is about to enter on a terra incognita or to plunge into some mysterious and unintelligible darkness. A few words of encouragement at the outset seem therefore desirable. I do not wish to pretend that the subject of land-tenure is free from difficulty, still less that it is impossible to be in doubt regarding many questions which have to be decided on a comparison of more or less fragmentary evidence, some of which is traditional and much of it matter of direct or indirect inference. Holt Mackenzie, an eminent authority on Revenue matters -- he was Secretary to the first Revenue Commission which originated the Board of Revenue for the North-West Provinces -- said that he had been all his life studying land-tenures without understanding them ; and the older text-books abound with remarks to the same general effect. But it should be remembered that Holt Mackenzie lived and studied in the early years of the present century, when village-tenures were only just discovered, and when everybody's mind was filled with the one idea, that the only possible form of land-holding was by a landlord who let his lands to tenants at a stated rent. The early forms of property had not been [S. 2] considered. No Haxthausen, Von Maurer, De Laveleye, H. S. Maine, or Seebohm, had yet arisen to set men thinking and comparing and making use of the materials that were to be found in different countries. Sanskrit and Arabic literature and law were only beginning to be explored, and no one had found out anything about the history of the Aryan conquerors and colonizers of India1, still less about the so-called Dravidian races which before the Aryan inroad had formed organized States in Central and Southern India, or about the Kolarian tribes whose remnants are still found in that part of Western Bengal called Chota (properly Chutiyā) Nāgpur, in the 'Santāl Parganas,' and in the Vindhyan Mountains which divide Upper and Central India. Our sources of information have immensely multiplied since those days. Not only have we works whose chief value is that they suggest the right use of materials tell us how to extract the pure metal from the crude ore of tradition and semi-mythical literature, and to read the meaning of ancient forms and customs, but we have for nearly every district in India valuable materials in the form of 'Manuals' (for the Madras districts) and the volumes known as 'Settlement Reports' in other Provinces. I may explain that when the Land Revenue Settlement operations of a district (or part of a district) are concluded, when rights have been recorded, and the interests of all classes in the land set down in due form, and when the assessment of the revenue on the field, the 'village' or the estate (as the case may be), has been determined, the Settlement officer gathers up the results of his work in a printed volume (in English) which contains the history of the district and all peculiarities of its locale, its people and their land-tenures. In preparing this Manual I have studied some dozens of such reports. They are not indeed always easily obtained, nor are they light reading especially to [S. 3] those who have not official knowledge and experience2 -- but many of them are storehouses of valuable information. At the beginning of the century no such aids were available, for one of the many misfortunes attaching to our first Settlements in Bengal and Madras (Permanent Settlements as they are called) was that no information about tenures and agricultural customs was recorded. The early writers could find in the celebrated 'Fifth Report on the affairs of the East Indies,' presented to the House of Commons (1812, and since reprinted in Madras), a multitude of unarranged and rather confused details about the landholders in Bengal and North Madras called 'Zamīndārs,' but that is all. And without enlarging on a subject which must be unintelligible till we come to our chapter on land-tenures, I will only say that the tenure of the 'Zamīndār' of Bengal represents a late --if not the latest -- development in land-interest, and was the localized outcome of a dying and corrupt system of State management. The study of it threw no light on the real customary tenures of the country. 1 I doubt whether Holt Mackenzie had known Col. Tod's Study of the Aryan (Rājput) tribes whose last permanent home was in the States of modern Rājputāna, or whether he knew of Col. Wilk's Study of the Hindu State organization as exemplified in Mysore. 2 There are also volumes of reprints of special reports and papers known as ' Selections from the Records' of the several Governments. Among the notable Settlement Reports I may instance as samples (but there are many others almost equally valuable) Elliott's Report on Hoshangābād (Central Provinces), Benett's on Gondā (Oudh), Ibbetson on Karnāl (Panjāb), Roe on Multan (Panjāb), Logan on Malabar (Madras), and Pedder's Bombay Reports. It is true that I have found a single report of 1796 describing the real natural tenures of the Benares districts : but I have rarely seen it quoted ; and all our early authorities, who are responsible for the dissemination of the idea that Indian land-tenures are unintelligible, appear only just to have heard of 'village' tenures, and to have started with the idea, derived from Bengal, that all land must have some landlord, with tenants under him. In studying, then, the land-tenures of India, we must be prepared for difficulties, and expect to find lacunae which we cannot fill up or only supply conjecturally and provisionally ; but it would be exaggeration to go on saying that a fair amount of clear knowledge on the subject is [S. 4] unattainable1 with moderate study and a fair memory for facts. 1 If by 'understanding' land-tenures we mean possessing a complete theory of origin and growth, perhaps land-tenures will long remain ' not understood.' But if we mean that we cannot accomplish the more modest task of getting an adequate knowledge of the facts as they are, or as they have become, then I see no reason for supposing that we are or need be in any such position of difficulty. And as to the systems under which the Land-Revenue is assessed and afterwards collected, there is no excuse for regarding their study as of excessive difficulty, when there is scarcely a province that has not its Land-Revenue and Tenancy Acts and Regulations besides many hand-books and volumes of circular orders, and special Reports. In the aggregate, no doubt, these documents form an extensive and even a forbidding literature ; and they are often written so as to be puzzling to a beginner, or a nonofficial reader. A guide to them is necessary, and it is the express object of my present work to supply the need: whether the object has been in any degree satisfactorily attained, it will be for the reader to judge ; but I may explain, that I have endeavoured to give only the essential features of the Acts and orders, confining myself to what is really important and practical, while I have indicated in footnotes the sources whence a more detailed knowledge may be obtained. May I be permitted also to add a word of general explanation as to my method. It may be said that subjects are treated in too positive or even dogmatic a manner. But in the first place, space is limited, and room could not be afforded for many qualifying and apologetic paragraphs and for repeated drawbacks on the statements made. Moreover, a continued hesitancy, a suggestion of conflicting possibilities and an atmosphere of scepticism and uncertainty, is apt to be puzzling to a beginner ; and it is beginners and 'outsiders' to the Revenue official circle that have been kept in mind. I have endeavoured to give my authorities, and to state as fact only what is fairly receivable as such : if any one thinks the facts lead to other [S. 5] conclusions than those I have drawn, he will have no great difficulty in working out another view. Possessed in the first instance of a definite outline of the subject, even if it is too strongly drawn in parts, the student who afterwards goes into detail in Indian official life, will fast enough discover where he would prefer to draw the lines a little more faintly or uncertainly, or where he would desire to give a different colour to the phenomena of landholding customs. The text will always afford a sufficient indication where there is room for an interpretation other than that which it adopts. With these few prefatory explanations I may at once proceed to the direct subject of the chapter. I have to discuss certain general topics which it will be useful to explain by way of preparation for the study which we are to enter on. Sir John Strachey, in his admirable Lectures on India1 -- a work which I advise every student to read -- has already spoken of the dangers attaching to the use of a general term like 'India.' It is geographical only. In no other sense is there any one country which can properly be called 'India.' Within the confines of the area so marked on the map, we have a series of provinces inhabited by different races, and often speaking different languages. The inhabitants of the Panjāb for example even in the same province are so different, that a Peshāwar tribesman in the north could hardly make himself understood at Delhi or Hisār in the south-east. Religious and other differences divide the populations, and racial antipathies are not unknown : Sikhs have no love for Hindustānis, and a Bengāli Bābu2 at Lahore is regarded as a foreigner almost [S. 6] as much as the Englishman is. The mere fact that one portion of the general population is Hindu and the other Muhammadan is in itself a permanent source of difference. And there is little internal uniformity among those who are called Hindus, and little more than a semblance of it among the Muhammadan races, despite the fact of a common creed and a common form of worship. 1 'India,' by Sir John Strachey. London: Kegan Paul, Trench & Co. (1888). i vol. Those who have read Sir A. Lyall's Asiatic Studies know how protean in form Hinduism is ; local deities and deified personages are readily adopted, thus giving a different complexion to the worship of each locality: in fact there is nothing common to Hindus as a body, except certain social ideals and rules. Otherwise the Hindu castes in the several provinces, have very little connection. The Sikh religion, again, is far removed from the Hindu ideal ; and the great bulk of the peasant population of the Panjāb that is returned as 'Hindu,' is so only in the sense that the people are not Sikhs and are not Muhammadan. They have learned a certain respect for Hindu festivals and for Brahmans, because those ubiquitous caste-men travel everywhere and skilfully introduce at least a portion of their ideas ; but the Hindu law of the books and commentaries is unknown to the Jat and Gūjar and Rājput landholding peasantry. Even among Muhammadans, to say nothing of hostile sects of Shīā and Sunnī, great numbers are perfectly ignorant converts, knowing nothing beyond the simple formula of the faith. In the Panjāb, for instance, these people follow their local customs of inheritance ; and it is perhaps chiefly the action of the law-courts that enforces a certain respect for the regular law in matters of marriage, divorce, minority and bastardy, otherwise it is not known or respected in practice. In a word, the various castes and races in the different provinces diverge from one another as much (or more) as the people of Scotland do from those of Naples, or the peasantry of Normandy from the mountaineers of the Tyrol. Common influences there are, which have extended far and wide. The Muhammadan conquest, for example, introduced [S. 7] the use of Persian or Arabic terms regarding land all over India, and with the terms, many practices and principles of Revenue management. And certain land-customs and family customs derivable from early Dravidian and Aryan traditions among Hindus, as well as official titles derived from the Rājput State System, may be traced in provinces widely separated. But while we shall take note of such wide-spread influences, and make the best use of the facts they disclose, we shall not be misled into supposing that all Indian peoples are more or less identical, or their ideas the same. Of the mistaken supposition of unity throughout 'India' we shall soon meet with practical examples. I shall shortly have to explain how the same conditions of life have brought about everywhere the aggregation of the cultivating classes into groups, which we call 'villages,' but they are not all in one form. Yet we find the standard histories of India giving general accounts of the 'Indian Village' as if the form described was prevalent everywhere and one general description sufficed for all. Another instance of confusion is perhaps more due to the use of a common name than to any assumption of unity among the provinces. I allude to the term 'Zamīndār.' We first came in contact with a certain class of landholder in Bengal known by this name, and from the language of some of the earlier Regulations and minutes, it would seem as if the same form of landholding must exist everywhere. This of course is not the case. But unfortunately the vernacular term (in itself) means 'holder' of 'land,' and so it easily got used to designate entirely different things. It is applied to particular forms of landed interest, entirely special or local, it is also used in the widest sense to signify the landholding class generally. If you meet a peasant in Northern India, for example, and ask him who he is, he will probably reply, 'I am a poor man -- a zamīndār.' He does not mean that he is a great estate holder." Abb. : Sonthals. Aboriginal. Bhaugulpore Hills. The people of India : a series of photographic illustrations, with descriptive letterpress, of the races and tribes of Hindustan, originally prepared under the authority of the government of India, and reproduced by order of the Secretary of State for India in Council / edited by J. Forbes Watson [1827 - 1892] and John William Kaye [1814 - 1876]. -- London : India Museum, 1868-1875. -- 8 Bde. : Ill. ; 32 cm. -- In v. 1-3 the letterpress is by various authors; in v. 4-8, by Meadows Taylor [1808 - 1876]. -- Online: http://www.archive.org/index.php. -- Zugriff am 2008-06-09. -- "Not in copyright." "During the administration of Lord Canning, from 1856 to 1863, the interest which had been created in Europe by the remarkable development of the Photographic Art, communicated itself to India, and originated the desire to turn it to account in the illustration of the topography, architecture, and ethnology of that country. There were none, perhaps, in whom this interest was awakened more strongly than in Lord and Lady Canning. It was their wish to carry home with them, at the end of their sojourn in India, a collection, obtained by private means, of photographic illustrations, which might recall to their memory the peculiarities of Indian life. The great convulsion of 1857-58, while it necessarily retarded for a time all scientific and artistic operations, imparted a new interest to the country which had been the scene of, and to the people who had been the actors in these remarkable events. When, therefore, the pacification of India had been accomplished, the officers of the Indian Services, who had made themselves acquainted with the principles and practice of photography, encouraged and patronized by the Governor-General, went forth, and traversed the land in search of interesting subjects. In this way the design soon exceeded the dimensions of a mere private collection, but Lord Canning felt that its importance was sufficient to warrant official sanction and development, and, therefore, placed the matter in the hands of Mr. Give Bayley, his Home Secretary. Some of the more important results appear in the present work. The photographs were produced without any definite plan, according to local and personal circumstances, by different officers ; and copies of each plate were sent home to the Secretary of State for India in Council. After a time, it appeared that a sufficient number of illustrations had been received from various parts of India, fairly to represent the different varieties of the Indian races. The negatives remained in India ; but from the plates sent home it was easy to produce fresh negatives, the prints of which might be multiplied to any extent. The Secretary of State in Council sanctioned this operation, and the work was executed by Mr. W. Griggs, at the India Museum, under the superintendence of Dr. Forbes Watson. 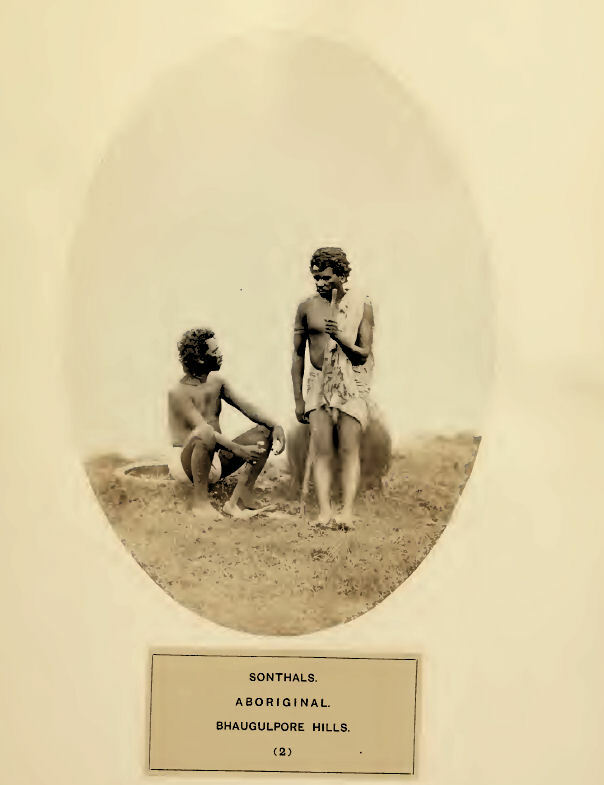 In many cases some descriptive account of the tribes represented accompanied the photographs sent from India. These varied greatly in amplitude and value. But on the whole it may be said that they were sufficient to constitute the basis of the sketches contributed by Mr. John R. Melville, Colonel Meadows Taylor, Mr. Kaye, Dr. Forbes Watson, and others. These sketches do not profess to be more than mere rough notes, suggestive rather than exhaustive, and they make no claim to scientific research or philosophic investigation. But although the work does not aspire to scientific eminence, it is hoped that, in an ethnological point of view, it will not be without interest and value." [Quelle: The people of India : a series of photographic illustrations, with descriptive letterpress, of the races and tribes of Hindustan, originally prepared under the authority of the government of India, and reproduced by order of the Secretary of State for India in Council / edited by J. Forbes Watson [1827 - 1892] and John William Kaye [1814 - 1876]. -- London : India Museum, 1868-1875. -- ( Bde. : Ill. ; 32 cm. -- In v. 1-3 the letterpress is by various authors; in v. 4-8, by Meadows Taylor [1808 - 1876]. -- Bd. 1. -- 1868. -- Online: http://www.archive.org/details/peopleofindiaser01greauoft. -- Zugriff am 2008-06-17. -- "Not in copyright."